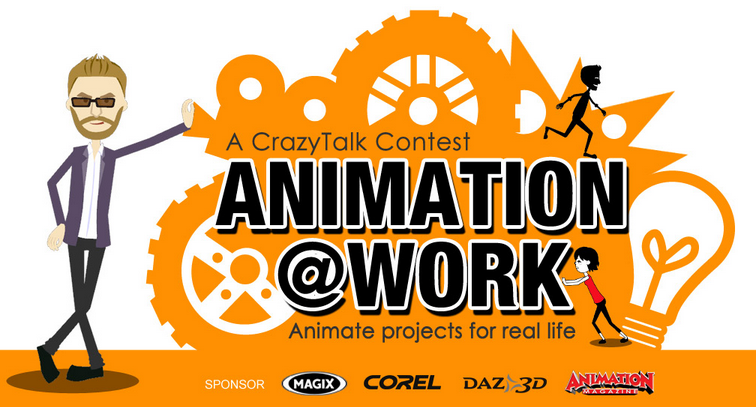 Reallusion, the creators of Crazy Talk Animator, are holding a competition titled Animation @ Work with cash prizes of up to US$1000.00 for the top three best videos as chosen by the judges. Other prizes include software, gift cards and magazine subscriptions. There are four main categories; Business & Training, Infographics, Comedy/Parody, Animated Comic. Entries must be submitted via the competition website before May 5th 2014. The competition had five early bird prizes for entries submitted before March 31st which I attempted to try and score with my entry to the Business & Training category below. Unfortunately it was not to be and I missed out on a free copy of Reallusion's soon to be released content pack, G2 Power Tools, Volume 2. Although I really did want to win the content pack this particular entry was more an exercise in seeing if I could create a business explainer video within my usual 14 day turnaround time for an explainer video created with GoAnimate. For the most part I achieved that goal however you may have notice the animation on the Arnold Schwarzenegger character is particularly awkward (and my Scientist guy makes a really odd hand movement in his second appearance that I'm sure I didn't key frame. As far as Arnold goes I had a few issues where I would animate him later in the video and the key frames would mess up key frames from earlier scenes. I'm not sure why but I didn't have the time to resolve the issue. With a month to go on the competition I'm considering making a second entry for one of the other categories. We'll see how things go and, of course I'll write about it here if I do. its good work keep it ..... !